Scientists from The Lazarus Project – named for the biblical Lazarus of Bethany brought back to life by Jesus and not the decidedly average 2008 Paul Walker movie – are trying to restore Australia’s southern gastric-brooding frog. The gastric-brooding frogs (Rheobatrachus) were a genus of ground-dwelling frogs native to Queensland in eastern Australia. The genus consisted of only two species, both of which became extinct in the mid-1980s. The genus was unique because it contained the only two known frog species that incubated the prejuvenile stages of their offspring in the stomach of the mother. The mother frog converts her stomachs into a womb. She swallows her own eggs and stops making hydrochloric acid in her stomach to avoid digesting her own young. Around 20 to 25 tadpoles hatch inside her and the mucus from their gills continues to keep the acid at bay. 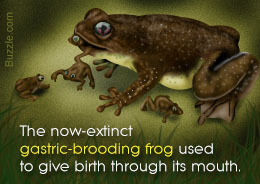 The southern gastric brooding frog has been listed as Extinct by the IUCN because it has not been recorded in the wild since 1981, and extensive searches over the last 35 years have failed to locate this species. Unfortunately, not long after researchers began to study the species, they vanished. “The frogs were there one minute, and when scientists came back, they were gone,” says Andrew French, a cloning expert at the University of Melbourne and a member of the Lazarus Project. 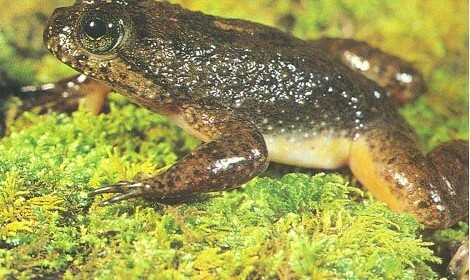 The bizarre gastric-brooding frog– which uniquely swallowed its eggs, brooded its young in its stomach and gave birth through its mouth. But the Lazarus Project team has been able to recover cell nuclei from tissues collected in the 1970s and kept for 40 years in a conventional deep freezer. The “de-extinction” project aims to bring the frog back to life. The team hope their work with hybrid cells could eventually help bring back other mammals, such as the Tasmanian tiger or woolly mammoth. Though the revival of a mammoth or a passenger pigeon is no longer mere fantasy, the reality is still years away. In March 2013, UNSW Professor Mike Archer and his colleagues made international headlines when they announced they had succeeded in growing early-stage cloned embryos containing the DNA of the Gastric-brooding Frog, which became extinct in 1983. To bring the extinct gastric brooding frog back from oblivion and, in doing so, provide hope for the hundreds of other frogs that are heading that way. Getting the embryo was a milestone and Archer is buoyantly optimistic that he’ll cross the finish line soon. Lazarus, he says, will rise again. De-extinction advocates counter that the cloning and genomic engineering technologies being developed for de-extinction could also help preserve endangered species, especially ones that don’t breed easily in captivity. Rather than habitat loss and fragmentation, the usual human-caused extinction cause,James Cook University herpetologist studies global frog populations and their decline from the widespread and deadly chytrid fungus. The researchers are going to continue their frog cloning attempts. They may also attempt to clone the Tasmanian tiger, the dodo and the woolly mammoth. While the idea of de-extinction is alluring, and exciting, more should be done to stop the human-caused processes that actually cause species to be threatened! It’s a continual battle against monetary forces, and industries in the lap of businesses and corporate powers. Just finished watching the ABC doc re Lazarus Gastric Frog cloning project. You reached a point of pre-tadpole and then the process suddenly ceased as it had previously at the 4 cell stage of development much earlier in the project. Therefore this would suggest that you have the correct process, but you have the equivalent of an environmental factor affecting the life process. I would suggest you look towards factors of (minute) trace petrochemical contamination of frogs from the plastic tanks they are kept in, and eggs from plastic from plastic petri-dishes, fluids from being flushed through plastic syringes and plastic tubing etc. I would basically be ensuring that only sterilized glass, stainless steel, and medical silicone be involved in the process. And new frogs collected and then kept in glass tanks rather than plastic ones, also what is clear to me is that you are not truly concerned about the frogs welfare otherwise you would keep the frogs together in tanks providing them with an environment mimicking their natural environment. How would you like to be kept isolated in a plastic tank, with massive creatures constantly peering at you manhandling you and poking at you? These are not gods creatures, they are Mother Natures creatures just as you and I are, and given the vile inhumane history of scientists who cold bloodily treat their fellow living creatures as specimens to be experimented on (e.g. Harlow), rather than as they would expect to be treated themselves, and treat Mother Natures Kingdom with utter contempt. You should look to your consciences, because I do assure you what goes around does sooner or later come around, whether you believe it or not. And Mother Natures anger in the form of the ravages of climates change we are now currently seeing, are only the beginning of what is to come. Did this project succeed? And what is goin on now? Thank you. Unfortunately I couldn’t seem to find any updates about this project. It was last written about in 2015, apart from our article in 2017. There are no updates online. If I were you, I would contact the University of Melbourne and ask?